A novena is a term used to describe a continuous praying of a formula nine consecutive times, usually nine consecutive days or once a week for nine weeks. The number nine derives from the time Mary and the Apostles waited for the coming of the Holy Spirit between Ascension and Pentecost. (from the Catholic Encyclopedia) This purse-sized prayer guide contains many of the Church's treasured petitions to Jesus, the Holy Spirit, the Blessed Virgin Mary and Saints, including Saint Anthony, Saint Peregrine and Saint Therese of Lisieux. A section devoted to American Saints includes a prayer to the North American Jesuit Martyrs. A new ?quick novena? from Blessed Teresa of Calcutta appears here for the first time in print. Illustrated throughout with art and religious images, each prayer in The Church's Most Powerful Novenas includes the history of that particular novena. A listing of shrines connected with novenas in the book is included. 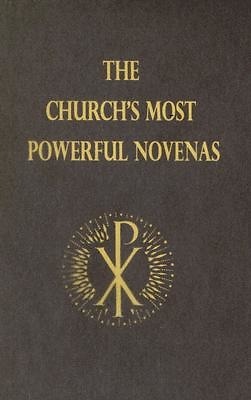 Although the practice of praying novenas has only been around since the 1600s, believers have embraced this commitment of devotion as a unique aspect of our Catholic identity.